Venezuela’s ruling party , the United Socialist Party of Venezuela, (PSUV) suffered its first parliamentary loss in 17 years after the opposition coalition, the Round Table of Democratic Unity (MUD), won 112 of the 167 seats in the Venezuelan National Assembly. “It’s not a time to cry, it’s a time to fight,” stated Maduro. “The struggle for socialism is just beginning – we are experts in starting over, we came from the streets, we are the people of difficulties,” he added. President Nicolas Maduro called for the rebirth of the Bolivarian revolution “in the spirit of April 13,” the date that his predecessor Hugo Chavez was restored to power after a short lived coup d’etat. Maduro’s comments came during his weekly television show following a meeting with the coalition of left-wing parties that supports his government. That coalition fared poorly in the parliamentary election, winning 55 seats in the National Assembly to the opposition’s 112, a stunning defeat, its first parliamentary electoral loss in 17 years. On his show, Maduro called for a return to the “original spirit” of the revolution, and promised to fight for public workers who fear a right-wing led parliament may seek to take away their jobs. “If I have to go personally to defend the workers of (public broadcaster) ANTV, Ramos Allup, I will go there,” said Maduro, directing his comments to one of right-wing leaders of the opposition bloc. Maduro also announced the creation of a new law to protect workers’ stability for the next three years. His announcement follows threats from some opposition leaders to get rid of the country’s highly advanced labor law. 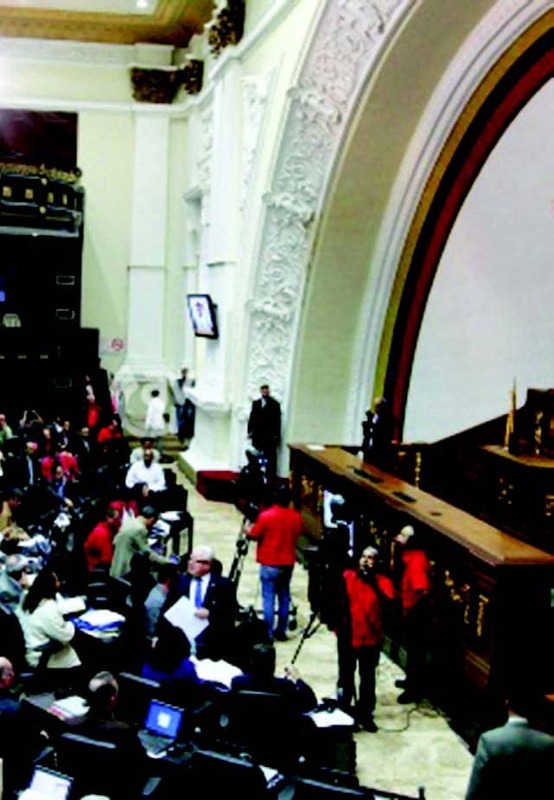 However, with a super-majority of 112 seats, the opposition is able to get rid of any laws, including those created this month by Maduro or the current national assembly, before the new assembly swears in on Jan. 5. Also with a two-thirds “super majority,” the MUD could call for a referendum to oust President Nicolas Maduro, reappoint Supreme Court justices and call a special assembly to make changes to the constitution. The MUD has vowed to seek to remove Maduro from office, and make sweeping changes to the constitution.